James Tavernier had better watch out after new addition Matt Polster confirmed he’s aiming to take the captain’s place in the side. In words which probably won’t horrify too many fans, the former Chicago Fire utility man admitted he wasn’t content to sit on the bench, and actually named the player whose place he intends to take. Admittedly he also suggested he would be happy to earn his place in midfield too, but it was his strongly-driven ‘threat’ to his team mate which stood out the most and shows this is a player motivated to succeed. 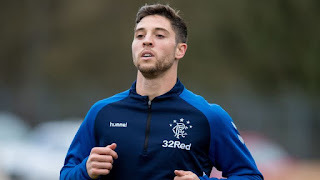 Polster’s finest season in football was at right back for the Fire and while perfectly adept in midfield too the American would probably argue his best slot is at the right of the four. And if typical American career-driven motivation is anything to go by, James Tavernier better look over his shoulder because someone wants his place. And is determined to prove he can take it. Just get him played and we'll SEE what's what and what, he can contribute.